Proper disposal of dental waste is crucial to safeguarding staff, patients, and the public, as well as protecting the environment. Laws differ by state, so check with your dental waste disposal provider to make sure you are compliant. However, there are certain guidelines that every dental practice should know and follow. Soft soiled waste disposal Blood and body fluid precautions are designed to reduce the risk of spreading diseases such as Hepatitis C and D. Following these precautions means safely disposing of soiled soft waste generated in your procedure room. Your dental waste disposal provider will supply you with small and large red bags or other red waste receptacles. Place your soft soiled waste, such as blood or saliva-saturated cotton or gauze, extracted teeth, and surgically removed hard and soft tissue in the small red bags. The small bags should be kept close at hand in every procedure room. 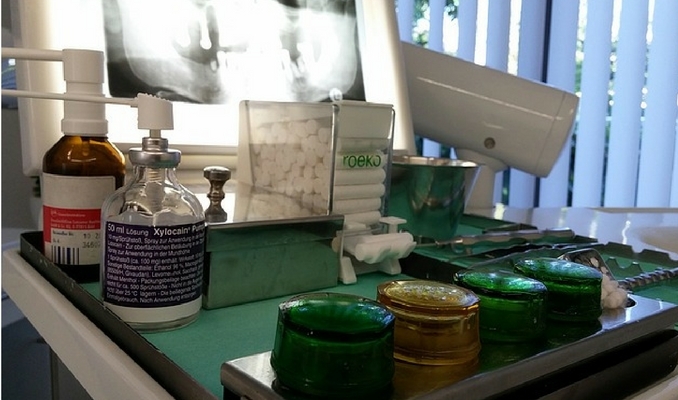 This minimizes staff and patient exposure to dental waste. When they are full (but never to overflow), seal or fasten the bags shut and place them in the larger red bag or receptacle for pick-up. The ADA does not recommend using bulk elemental mercury (liquid or raw mercury). If you have bulk elemental mercury in the office, ask your dental waste disposal provider if they accept bulk mercury. It should never be poured down the drain or placed in the red bag where you normally place soft soiled waste, nor mixed in with your regular solid waste. The use of chairside traps and filters in your office vacuum system is a safe way to control dental amalgam. Disposable—rather than reusable—amalgam traps are preferable. Check with your dental waste disposal provider to see if they accept disposable amalgam traps along with your other amalgam waste. When handling amalgam, staff should wear protective gear such as utility work gloves, fluid resistant face masks, and safety glasses. Always use the designated sealed receptacle marked for amalgam waste given to you by your dental waste disposal provider. Make sure you talk to your provider about what can and should be placed in this container. Choose a provider who complies with the ADI-ANSI standard. Dental sharps disposal Disposing of dental sharps is the same as with medical sharps—place needles, scalpels, glass carpules, burs, acid etch tips, files, blades, orthodontic wire, etc. in designated sharps containers. Always keep these containers close at hand and be careful to not overfill them. Chemicals, disinfectants and sterilizing agents disposal Always check the Material Safety Data Sheets (MSDS) for safe handling and disposal of all chemicals, disinfectants and sterilizing agents. If possible, avoid using chemical sterilants; instead opt for steam or dry heat to sterilize your instruments. Sterilant absorbed on cloths or paper products, as well as emptied, rinsed sterilant containers can be placed with your regular solid waste. Never throw these away in the regular garbage, down the sink or in with compost. Contact your dental waste disposal provider to find out if they handle these particular silver and lead wastes. Following these guidelines for dental waste management is the best way to assure your staff and patients that you are protecting their health and safety and being mindful of your impact on the environment.